I found two precious chairs at GW. There were two ladies standing over them talking about them. I prayed them away from them. Super Power’s of prayer activated. They were talking about painting them black and throwing away the cushions. They needed blog intervention but I kept my mouth shut hoping they would talk themselves out of the chairs. My BP was probably so high at that point it was a good thing. See if I’m stuck in a Goodwill unable to leave. I get a little antsy in there. And when the bell is ringing……. I can barely take it. One chair looked like this. The other was the same but not falling apart. The upholstery and chairs were filthy. I could just see it with drop cloth off-white fabric…navy or red piping……. 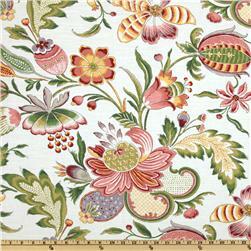 But fabrics like this at Pottery Barn…..
And this at Pottery barn……. Those “today” fabrics had me re-think getting rid of the old sturdy fabric. They were really good cushions. They were actually zippered slip covers over the old chair cushions. I know, I am grossing you out. But you can’t just get away with getting all the good here people. People….. and dirt dust was flying everywhere. Next time I’m wearing a mask. But I took one for the team guys! Want to see if it was worth it? These cushions are so comfortable! I spotted and washed the slipcovers and vacuumed and cleaned the old cushions. The stuffing inside was spotless and like packed cotton. To flip these pieces….just saving the dollars from slipcovers helps. I would use them like this. But I love this style of fabric. So, I am wondering if other people will. I love when styles make their cycle. Can you believe how close this fabric is to the others? I will show you how I did it tomorrow…..
What to do with an old spice rack…..
You are on a roll girl! I LOVE them & the fabric. FANTASTIC! Oh! Love the fabric! The chairs turned out so nice. Are they as heavy as they look? Really great looking, again! Wow, you do have an eye for good junk. That first pic made me say “what the H” out loud!! What a wonderful transformation. The cushions are fab! I can just see these chairs in a sunroom….lovely. Black!!? !Â Are you kidding me?Â I would have hyperventilated too!Â I think you did an awesome job, I love them in white!Â And the green pillows look wonderful with that fabric.Â I bet coral accent pillows would be a great (and different) spring/summer look. I just love what you did here…they are so cozy and gorgeous! They are soooo cute, I love them in white, I would have hyperventilated also if they were going to be turned black instead. OMGOMGOMGOMG!!!!!! !Â These chairs ARE my favorite of all you’ve done!Â ACK!Â I love them!Â So glad you kept the fabric that was on them….oh, girl.Â Let’s talk about that TV program…..and not just for your talent, but for your sense of humor!Â You da bom!!!! So glad you prayed those women away—black?? ?Â They are gorgeous and thanks for taking one for the team, seriously.Â I wear a mask (asthma) to go through the file cabinet.Â As for the fabric, I love it, too.Â Never would have known it wasn’t new.Â Laundry magician you are.Â And you must have one good vacuum. I found you on Tip Junkie, and I just LOVE what you did. I wish I was that talented! these are gorgeous! Â The way you write it hilarious! Â My stomach rolled when you talked about inhaling the people dander…..yes, go for the mask next time. Â I’m very impressed. wow! Â those are totally up to date with their new look! Â awesome job! Wow!Â Super duper adorable!Â Such a great transformation! SCORE! Beautiful redo. Â Glad you beat out the other ladies!Â Thanks for linking to Wicked Awesome Wednesday! Wow, you’ve got great vision! Â And how wonderful the cushions were in great condition…replacing those are expensive. Â Great job! Oh yeah – what a great transformation. Â I can hardly believe these are the same chairs. Great job :)Â You made my top 3 most clicked list from Tutorial Tuesday this week – congrats! These chairs are unbelievable!Â I would have totally walked by them.Â Good job!!! !Â I have prayed people away from something too …funny how that works.Â Ha! I’m your newest follower.Â Saw your post on Hope Studios. I wanted to let you know that I’ve got a great giveaway that ends Friday. It’s for $100 to wallquotes.com, and trust me they’ve got something I know you’ll love! Stop by and enter ASAP. I’d love to see what you would do with their products! See you soon! What a mess turned to some useful things.. what a great effort?